AMEN Corner: The Other AMEN Corner! What I’ve been noticing lately is that every church that I’ve ever pastored has been filled with sinners! If you are/were a member of New Hope Family Church, you might remember a time when a visitor brought in the youngest sinner we’d ever had. I know it looked innocent enough in its mother’s arms. They are all cute and cuddly when they’re only a few weeks old, but they are the most selfish and self-centered people in a service. I remember when that little sinner woke up and cried out for attention without any concern for the rest of us who were engaging in an important religious activity. For a long time, we had a bunch of sinners who were a few years older. Those were the noisy children who, after the service, had the impudence to be running around, having fun and laughing while us adults were trying to enjoy our lunch! Then there were the old sinners. Those are the ones that really frost my prayer beads! I remember the older man who would sing the hymns with gusto but sing out of key and the woman with dementia who would sometimes just start talking to God in the middle of my service! Should these disruptive senior sinners even be allowed in church? 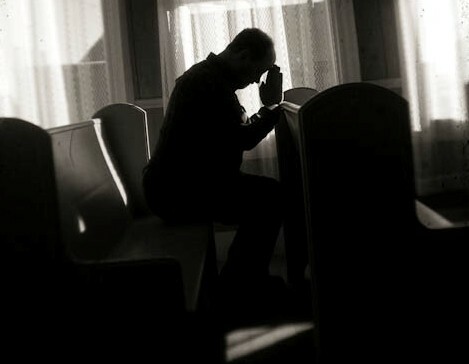 I’ve noticed some sinners come into church on a Sunday morning looking reflective and repentant. Who knows what they’ve been doing during the past week. What movies or television shows they watched. What they said that hurt a loved one. What their thoughts were that they would be ashamed to admit to anyone else. They have the audacity to come to church to worship with the rest of us when they know they have sinned in thought, word and deed – and that was just in the car on the way to church! You’re pretty observant like me so you probably noticed like I do that some of the sinners who attend church come in happy and lighthearted as if sin was the furthest thing from their minds. Yeah! Right! They sure don’t fool you or me! Some of the sinners at church come in early so that they can get the good seats in the back and some come in late and have to sit up front. Some are older and some are younger. Some women and some men. Some who have money and some who scrape by on pennies. Short, tall, heavy and thin. My point is that these are all sinners! And to be quite honest, there is one sinner that bothers me the most. That guy at NHFC that they’d call “pastor”? I suppose you could call him the “chief sinner” of them all. That’s also what the Apostle Paul called himself. “This is a faithful saying and worthy of all acceptance, that Christ Jesus came into the world to save sinners of whom I am chief.” 1 Timothy 1:15 And I’m sure that Paul was an angel compared to me! But one thing I’ve always been glad about at New Hope Family Church is that it has not been like some others I’ve attended. I was a director of men’s ministries at a very large church where everyone had to be a saint. The pastor was the chief saint and he expected us to be like him. I remember talking to a man who was crying because he had just been told to leave the church because he smoked. Then there was the guy who was asked to leave after he told the pastor he was gay. There was the family who was kicked out after their unmarried daughter became pregnant. Sinners were not allowed in that church and since I was in ministry leadership, I had to pretend to be a saint like everyone else did. If the truth be told, I really fit best in a church with other sinners who are seeking God’s forgiveness. No matter what I’ve done or have failed to do, when the prayer of confession is said before receiving Communion, and I can say “amen,” I feel the burden lift and I know that God has forgiven me. I know that Jesus called disciples like Peter, Matthew, John and the others who were also sinners just like me. Jesus even got Himself into trouble for eating and drinking with sinners just like me. Matthew 9:11-13 I know that Jesus died on the cross to save sinners like me. 1 Corinthians 15:3 And if we confess our sins then He is faithful and just to forgive our sins! 1 John 1:8-10 Can I get an AMEN here? Thank you for letting me ramble on and please remember to keep this all confidential. This has been very helpful for me. I like the church better now that I’ve been able to talk with you about this today. It helps when I realize that I can go to church and I don’t have to pretend to be a saint when God knows that I’m just an ordinary sinner saved by grace.